A child with Autism can usually do anything a Neuro typical child can through proper guidance. Teaching a child with Autism to swim allows them to work the large muscles of the body, which produce chemicals that are sent to the brain that produce further chemicals that improve cognitive function. Multiple mental disorders and diseases can be improved through physical activity. This has been seen in both children and adults in a variety of studies performed to link the benefits of exercise and cognitive function. Researchers have found that injured neurons in the brain can be stimulated through physical activity causing them to regenerate. New neurons are created while old neurons form dense interconnective webs that allow the brain to work faster and more effectively. For the parents of children with Asperger's Syndrome, Rett Syndrome and Autism Spectrum Disorders this is a light of hope. Knowing that a child with a pervasive developmental disorder can begin to better communicate due to mental stimulation is priceless. Though the connection between exercise and mental growth is not fully understood scientists are pleased to see many positive relationships have been found. With such knowledge many fitness experts are reaching out to their communities and offering physical fitness opportunities for children with autism and other pervasive developmental disorders in order to provide the beneficial tools to improve the lives of both parents and children. 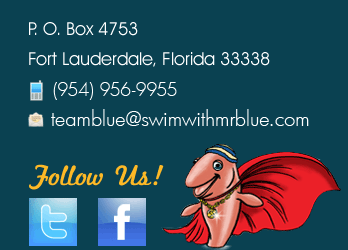 Julie Gross and her fellow professional swim coaches of Swim With Mr. Blue have experienced the beneficial side effects of exercise first hand. They occur on a daily basis, which is why they have created the Super Swimmers Foundation. Not only will the program help to produce successful swimmers but it will also improve a child’s speech, muscular tone and overall well-being. They understand that a child with autism can learn to swim and understand water safety. Swimming stimulates a child in a balanced manner working with sensory processing, gross motor skill development and increasing cognitive processing skills. Each child is unique and each swim lesson is approached in accordance with each child’s preferences and abilities in mind. Swim lessons are provided in small achievable steps that are broken down as needed, even beginning with the tolerance of putting feet in the water. Some children respond to the water with ease while others may require lessons to be broken down into extremely small steps for comfort. Swimming lessons for a child with autism or other concerns are adapted by taking a child’s response to water (fear or enthusiasm) into consideration along with their sensitivity to smell (chlorine), auditory processing and vestibular motion for a safe and comfortable learning environment. Julie Gross and her team have had countless success stories with their swimming lessons for the autistic child and continue to grow in these efforts through the Super Swimmers Foundation. 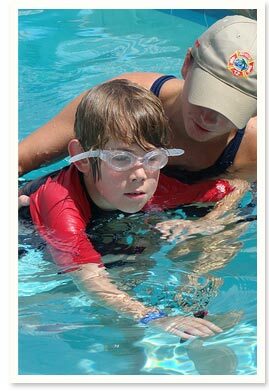 For more information about swim lessons for the autistic child, view our additional articles.